Tree leaves fall each year and rest at the base of the tree. During the previous growing season the tree’s roots reached several feet into the soil to seek out minerals and nutrients which are then delivered throughout the living tissues of the trees. Fifty to eighty percent of these nutrients end up in the leaves. 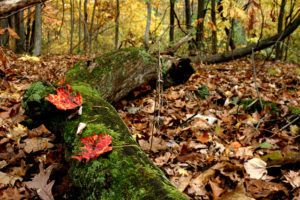 The fallen leaves decompose, adding biologically active organic matter to the surface of the soil. The minerals and nutrients are released in the process in a wonderfully efficient cycle. Nature has a special reason for this cycle. The tree is creating a nursery for its next generation. Fruits, nuts, cones, seeds of all kinds are shed into this rich layer. Birds and animals will consume some of them. Some of them will be attacked by insects or pathogens that prevent them from germinating. But some will find a place in this rich layer to nestle in and take root. Nature takes care of herself. Somewhere along the line we seem to have decided that fallen leaves are an urban eyesore. Maybe when we fell in love with lawns. It offends us to see those messy leaves strewn all over our “garden carpet”. We rake them up, bag them up, and drag them to the curb for pickup. This makes leaves easy pickings for the likes of me. I am more than happy to partake of this free resource. I call myself a “road raider”. I need a bumper sticker that says “This Truck Brakes for Leaves”. I haul hundreds of bags of leaves home from the curbsides of Houston every year. Really. Hundreds. I use tree leaves to mulch my orchards and some perennial beds. This practice has been called mulch gardening or sheet composting. 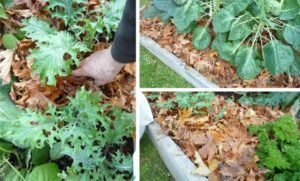 There are actually minor differences between the two practices, but they are often used interchangeably and “sheet composting” is generally better known. There is no need to quibble about the terms. the soil. It literally builds the soil in a very similar way that nature does. If you kneel down and pull back the layers, you can see how this works. The material closest to the soil is largely decomposed. The particles are not discernible as to their original form or color. They are dark, crumbly, and moist. The top layer is clearly recognizable as leaves. Some are still whole, others are broken, but they are clearly leaves. The layers between top and bottom are in various stages of decomposition somewhere between these two. Yes, tree leaves have a higher C:N ratio than a well-balanced compost pile would have, but it does not seem to have the same nitrogen depletion problem that one would have with some other high C:N materials. Perhaps because it is a slower and continual decomposition process. This material never needs to be cultivated. I do not turn it into the soil at any time. I just add more on top and let microbes, earthworms and other decomposers do their work. It is a continual process. When I fertilize or apply nutrients, we just broadcast it on top. It eventually works its way into the root zone. I do time the late winter fertilizing to be just before I put the replenishing layer down – fertilizer and dried molasses are broadcast before the leaves are applied. I am often asked if I worry about importing garden chemicals into my yard when I collect bags of leaves. Yes, and no. I avoid lawn clippings when I collect. People are far more likely to apply chemicals to their lawns than to their trees. I also prefer less affluent neighborhoods for the same reason. There is more of a chance that a contract lawn service leans on chemicals regularly, sometimes even without the homeowners knowledge! If I do pick any chemicals up within the leaves, it is likely to be mere trace amounts. I avoid bags that are filled with rough clippings, as from pruning shrubs and perennials. I want materials that will form a soft brown blanket on my yard, not a sticky brush pile. I wear gloves when I am dumping them and raking them out just in case there is a bit of trash or perhaps pet manure in the bag. It’s not been a big problem. I am not particular about the types of leaves I pick up. If I end up with 40 bags of one kind this time, I will end up with 40 bags of a different kind next time. Over time they all get mixed in. I don’t mow them or chop them up either. I might if I was putting them between small perennials, annuals, or dressing a front yard color bed with them. Leaves that have been mowed with a mulching mower and spread over a bed have a wonderful look. They break down quickly, improving the soil there and supporting the Soil Food Web. I am generally putting these down in wide open spaces between trees and large perennials or using them to smother grass and weeds before I put a new bed in. I use other mulches for other purposes, but tree leaves are a definite favorite. It is free to me, keeps the leaves out of the landfills, and returns the stored nutrients to the soil where they can be used virtually indefinitely. Do leaves attract Crazy Ants? People have expressed concern about leaf mulches inviting Crazy Ants. I have seen Crazy Ants in my yard. It is unfortunate that they are marching across the Gulf Coast seemingly unchecked. They are a nuisance, and present some economic concerns, but they are a non-biting ant and don’t present the same personal safety concern that Red Imported Fire Ants do. I have not observed them nesting in leaf mulches in particular. I usually see them in open areas, under my containers, or between bricks or pavers. I recommend avoiding using anything that concerns you about Crazy Ants, including a specific type of mulch or habitat in your yard. There is no need to stress over gardening. I also recommend broadcasting Dried Molasses regularly. It seems to repel ants of all kinds. We started broadcasting it in a band around the house when we first observed them, and increased our application to the yard. We seem to have driven them away for the time being. Read more about Crazy Ants here.